The name is misleading. They do not serve ONLY Biryani and neither is this restaurant ONLY at Borivali in Mumbai. They have their presence across 6 locations in Mumbai and the menu is populated with many dishes along with Biryani of course. 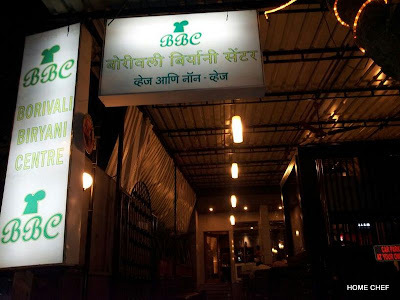 I visited the Thane outlet of Borivali Biryani Centre (BBC) located near Khopat. They have a sitting place outside and an air conditioned section inside. The clay pots decor outside has been left intact and reminds me of Masalazone which existed here earlier. Masalazone has a similar decor at Bandra as well. Read about it here. The reason I decided to dine here was a delicious dish called Noorani kebab. It was ordered during a home party. Remember I had mentioned BBC earlier here ? We decided to settle down in the air conditioned section as I thought it would be too noisy and humid outside. 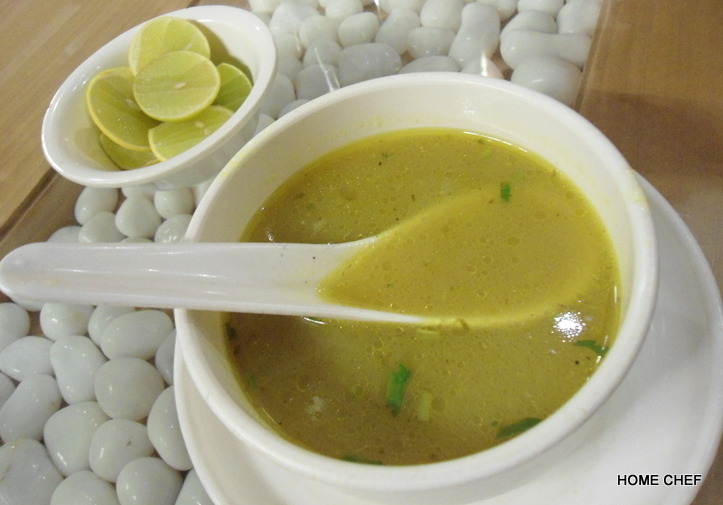 The Ghost Paya Shorba was ordered along with roasted masala papad. Now roasted masala papad is something I invariably order to munch on, whenever I am dining out at an Indian restaurant. Some restaurants sprinkle fine sev on the papad which makes this simple dish interesting. The Ghost Paya Shorba arrived quickly. The menu says it is lamb feet simmered with "rare herbs" and spices. I found it just about there. The consistency was too watery and the zing was missing. The "rare herbs" could not save this dish. 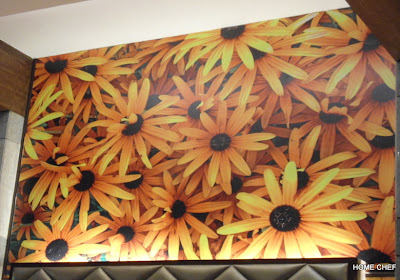 The place has an entire wall filled with huge sunflower pictures. A bit too bright but cheerful nevertheless. While I was munching on the papad and choosing my pick from the menu I tried the chutney on the table. Difficult to remember if it was mint or coriander but what I do remember is that it tasted foul. Such negligence is unexpected from a well established restaurant. Next up was the Noorani Kebab and Biryani. 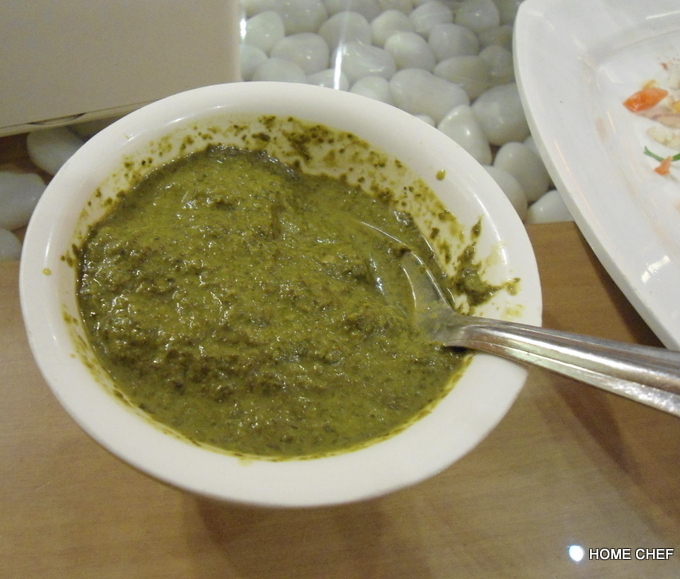 Noorani Kebeb is a BBC signature dish. 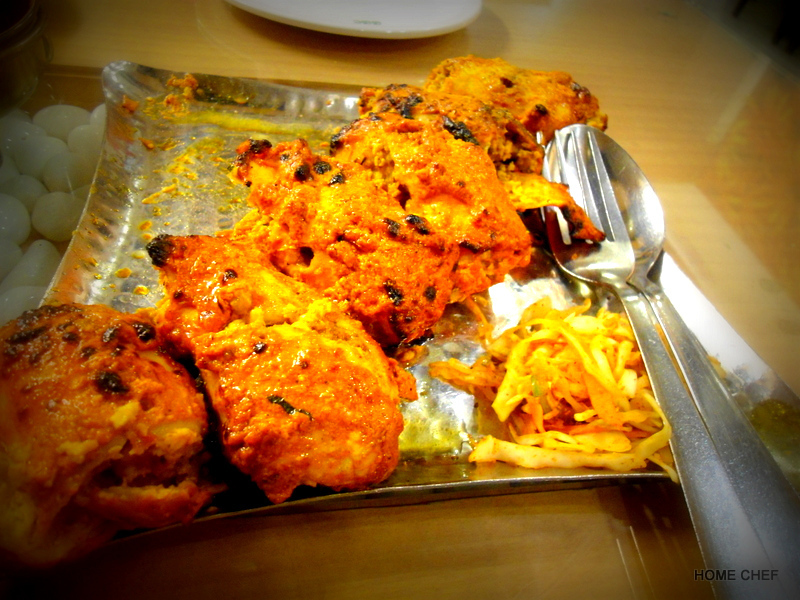 It is chicken breast stuffed with minced lamb, spices and herbs and coated with Tandoori masala. The kebabs are charcoal grilled and so delicious. Forget about your diet plans and enjoy gorging on these soft delicious pieces of meat. I totally recommend the Noorani Kebabs at BBC. Now for the dish which is the name itself. We ordered the Ghost Dum Matka Biryani. I confess its difficult to like any Biryani once you have had the Biryani from Hyderabad. 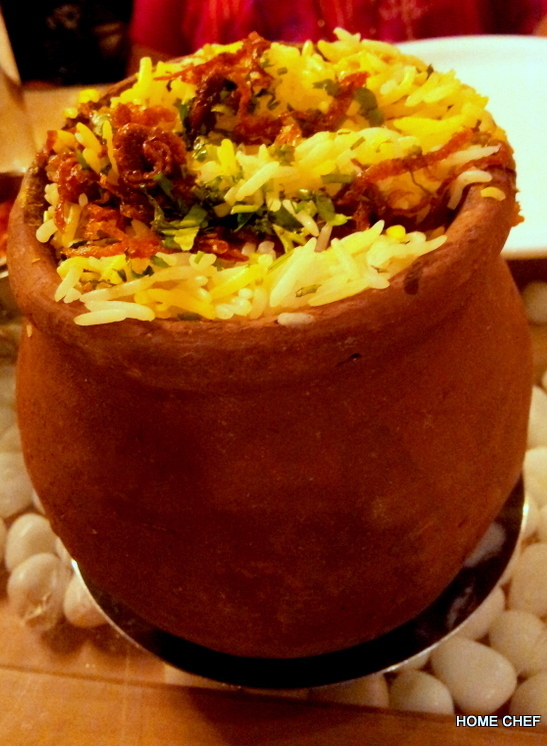 The Ghost Dum Matka Biryani was average. I appreciate that it was not too oily or spicy and the chef spared us of the strange strong essence which a lot of restaurants add in their Biryani. The lamb was well cooked and the portion generous. I liked the whole serving from a clay pot thing. It looked like this. A meal for 2 costs approx INR 600. The service is quick and can be better. I wish they realise that though songs playing softly in the background is fine but a radio jockey speaking is annoying. It was difficult to have a conversation as they had tuned into the radio mode. Do visit BBC for the Noorani Kebabs if not for anything else.